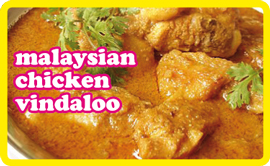 Here’s the Malaysian variation on India’s Vindaloo. The two aren’t that different to be honest other than the Malaysians making it a lot less fearsome. You can adjust the spice to suit your personal taste, but as it stands it’s not going to blow your head or your toilet away. Pour over 3 tablespoons of red wine vinegar and 1 teaspoon salt over the chicken. Coat well, cover and refrigerate for 1-2 hours. In a food processor or with a hand blender, blend into a smooth paste the garlic, ginger, paprika, cinnamon, cardamom, cumin, pepper, turmeric, chili and cloves. Add this to the chicken and place back in the fridge for another 4 hours. Heat 3 tablespoons of oil in a wok over a moderate heat and fry the onions for 4-5 minutes until softened. Add the chicken and fry for 3 minutes until sealed. Add the paste and stir for a further minute until aromatic, add the tomatoes and cook for another 2-3 minutes. Add 1 1/2 cups water and the sugar and bring to the boil. Reduce the heat to low and simmer for 45 minutes partially covered. Remove the lid after 30 minutes to reduce the sauce. Sprinkled with chopped tomatoes alongside plain boiled rice. NOTE: To up the ante on spice, add up to 6 whole red or green chillies, making slits down their length to enable them to release their magic. Remove before eating, or eat them if you’re up for it.